This Phone has a 4.5 inch capacitive Super LCD 2 Display. HTC is know for using super LCD 2 displays. Unlike regular LCD display this display does not have air gap between outer glass and display element. Thos produces less glare and makes the user feel closer to the display itself. It also increases outside visibility and decreases power consumption compared to the regular LCD. The resolution of HTC Desire 600 display is 540 x960 pixels which will give you a pixel density of 245 ppi (iPhone 4 has 326 ppi). This is above average quality display and with Super LCD 2 you wont face any pragmatic problem of resolved pixels. This phone is powered by Qualcomm MSM8625Q Snapdragon 200 quad core processor clocked at a frequency of 1.2 GHz and based on ARM cortex A5 architecture. Many manufacturers are offering much faster processors at this price range. The internal memory of this device is 8GB which is expendable to 64 GB using a microSD card. RAM capacity is 1 GB and this phone employs Android 4.1.2 jelly bean operating system. This phone has a autofocus 8MP primary camera with 3264 x 2448 pixels which is a very good quality. LED flash is also there for low lighting photography. It is capable of recording 720p videos at 30fps. Secondary camera of this device is of 1.3 MP for those interested in video calling. This is a Dual SIM phone which supports 3G connectivity other connectivity features include Wi-Fi, Bluetooth 4.0, GPRS, NFC, Infrared, EDGE and Micro USB. The physical dimensions of this phone are 134.8 x67x9.3 mm with a moderate weight of 130 grams. Battery capacity is rated at 1860 mAh with a talk time of 11 hrs 20 min with 2G and 11hrs with 3G. Acceptability of HTC, in recent times, has increased in Indian market and it has successfully enhanced its brand value. Many less popular brands are offering better specifications at this price range, though this phone will suffice for much more than general purpose usage and will provide you with a good display and camera features. 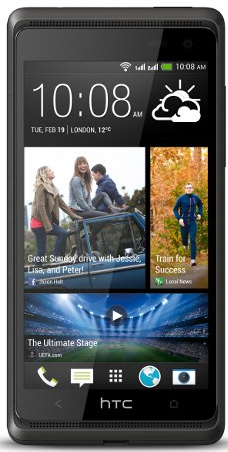 You can buy HTC Desire 600 from Saholic at a price of 26,860. You will also get a NOKIA BH-111 bluetooth headset worth Rs. 1599 free with this phone.